Urban legends about poisoned sweets or sharp objects inserted into candy and distributed to children by malicious strangers are just that: urban legend. Still, there’s nothing wrong with a precautionary check of any goodies kids bring home after a night out trick-or-treating. However, there are real dangers afoot during All Hallows Eve, and they’re not the typical monsters and ghouls you might expect. For example, studies have shown that Halloween has the highest rate of pedestrian fatalities, with most deaths involving children less than 15-years-old. These accidents regularly occur outside the safety of a crosswalk or without the use of reflective gear. Young children should never trick-or-treat alone, and everyone should use a crosswalk when crossing a street, and wear reflective gear to ensure drivers can see them clearly. Another common accident: trips and falls. Parents should help pick costumes that don’t put children at unnecessary risk. For example, face masks with poor visibility or small eye slits can make it difficult for a child to see an approaching vehicle or negotiate uneven sidewalks. Costumes that don’t fit properly (i.e., long sleeves or pant legs) can also cause a child to trip or fall. Haunted houses and spooky home decorations add ghoulish ambiance to fright night, but they’re also riddled with unseen cables, wires, and electrical work that’s not always carefully protected or marked for danger. Avoid walking through people’s lawns to ensure what can’t be seen doesn’t become a safety hazard, and warn children that respecting people’s property isn’t just for safety, it’s the law. The best thing you and your family can do to ensure Halloween is safe and enjoyable is review the Halloween Safety Tips below and have a plan in case you need it. Young kids don’t mind being chaperoned by an adult, but teens may have an entirely different idea of what “fun” looks like on Halloween night. For independence-seeking teens, technology offers some practical help for parents. 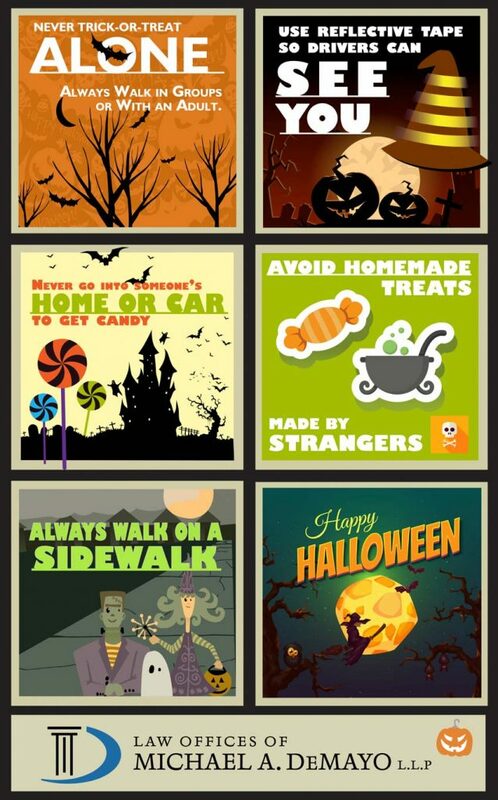 There are several apps available to help keep your mind at ease while teens trick-or-treat. FamilySignal LLC just released its latest version of uKnowFamily app, which offers real-time GPS location tracking, location history tracking, and instant alerts when kids don’t arrive or leave a specific location on time. The app is free and compatible with iOS devices. Another popular app you can try for free this Halloween is Life360 Locator. This location sharing app features real-time GPS location tracking plus extra add-on features that you’ll want to use all year long—not just during Halloween. Available for Android and iOS. Parents and caregivers don’t have to suffer through the uncertainty of trick-or-treating; they can simply track a kid’s whereabouts using his or her mobile phone. From everyone at DeMayo Law Offices, we wish you a safe and enjoyable Halloween! Want more safety updates from our North Carolina attorneys? Like us on Facebook or Follow us on Twitter to receive information you can use to keep your family safe.